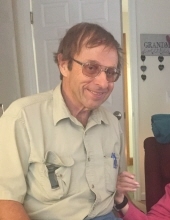 Richard Glen Cline, age 68 years, a resident of Red Creek, WV departed this life Wednesday afternoon, January 9, 2019 at the Ruby Memorial Hospital at Morgantown, WV surrounded by his loving family. He had been in declining health due to complications of melanoma. He was born Wednesday, November 15, 1950 at Elkins, WV a son of the late Glen William and Evelyn Gay Raines Cline. He had never married. Surviving are three nieces, Stacey Cohen and husband Jamey of Silver Spring, MD, Diane Elbon of Hanover MD, Kristy Davis of Richardson, TX; several great nephews; one great niece; and numerous cousins. Also, preceding him in death is one brother, Lewis Allen “Jim” Cline. He attended the one-room Flanagan Hill School and was a graduate of Mountaineer High School with the Class of 1968. He was a graduate of West Virginia University with the Class of 1972 with a degree in Mathematics. He had worked for Wolf Welding at Thomas and later as the water plant operator at Timberline Resort and for Whitmer, WV. He enjoyed fishing, hunting, gardening, collecting antiques and going to flea markets and working on cars. The family will receive friends at the Lohr & Barb Funeral Home of Parsons from 3 to 6 PM, Monday. On Tuesday, January 15, 2019, Mr. Cline will be moved to the Flanagan Hill United Methodist Church at Red Creek, WV where final rites will be conducted at 11 AM. The Rev. Jonathan L. Hedrick will officiate and interment will follow at the Flanagan Hill Cemetery at Red Creek, WV. To send flowers or a remembrance gift to the family of Richard Glen Cline, please visit our Tribute Store. "Email Address" would like to share the life celebration of Richard Glen Cline. Click on the "link" to go to share a favorite memory or leave a condolence message for the family.